Perhaps it was the fatigue of two days of splitting wood, perhaps it was lack of a good meal, perhaps it was dehydration, perhaps it was hormone related… but whatever it was I had a really rough time at ballet tonight and ended up in tears by the end of class. The last time that happened (when several pre-professionals joined our class and left me demoralized) I went out and bought cheerful yarn for cheerful socks because hey, even if I can’t dance well, I can knit better’n any of them (goddammit)! It was childish, petty, vindictive knitting. Bet you didn’t realize that was possible! Anyway, I was feeling pretty miserable as I dressed to go home when I noticed the socks I was pulling on. Yep, those self-same cheerful Jaywalkers. I may not be able to dance, but I can knit (goddammit) ! And now that I can, again, laugh at myself, it’s time to knit more socks. Being an extremely social and intelligent little fellow, Gabriel has been very jealous of Nikolai as he has to wait on the sidelines during preschool, ballet, swimming lessons….. because he’s still not a big boy. HA! Ever tried telling an independent 2 1/2 year old that he’s not a big boy? Not big enough? HA! 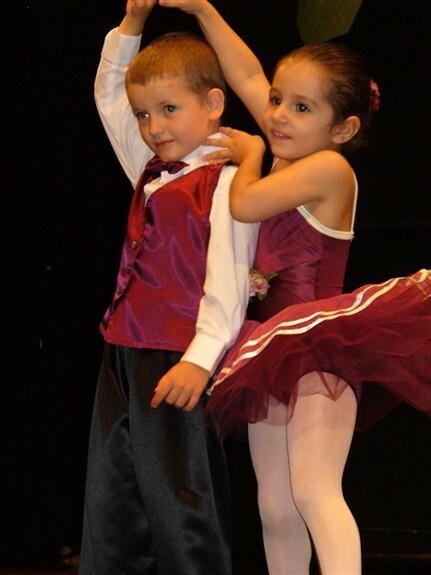 Our wonderful teacher at the local ballet school said he could join classes this summer, even though he won’t be 3 until November. Thank you! Learning to hop on one foot…. I’ve been mentally knitting those socks I showed you last time. Thank you for all the good advice. The yarn is similar to Fortissima Socka. The pattern calls for sz. 0 needles and that’s the fabric I like best, so I’ve been thinking about sidestepping the whole needle change by adding a back panel instead. The socks will be almost stocking height on me, so I’ve been thinking I’ll eliminate 2 pattern repeats but add a 12 stitch calf shaping panel. I’m hoping it will give me enough for large calves and come down enough for slender feet. My plan is to use the sz. 0 needles, start the ribbing on 72 sts (6 st repeat), then after the ribbing mark a 12 st panel for the calf and knit the other 60 sts in pattern (10 st repeat). After some swatching and measuring I think that 60 sts will be about right for my ankle and foot. The pattern, as written, uses 3 50gm skeins but I think with all the resizing I can knit them with two… Let us hope so. Nikolai chose the colors, and I figured out how to make self striping yarn in the Crock-pot. I can put up a tutorial if anyone is interested. One more thing: I’d like all of you to meet the wonderful lady who is my Aunt Dot. She got me started doing ballet, something I still love. We got to take a class together last weekend, a wonderful something we haven’t done for many many years. She taught me to knit when I was 9 (of course I didn’t start knitting until I was 24 but that’s not the point). She gave me all that wool, and we dyed some of it together while she was visiting. It turned out lovely and she’s thinking of trying her first pair of socks. And she loves my children and my children love her. What a Great Aunt! Pre-Script: My Nikolai is a very serious, very resistant, sometimes very shy young man. He does not know how to deal with attention (see this.) When Nikolai started taking classes at the end of March we took bets on whether he’d make it to the stage by June. We all bet against him, even his teacher. First post-term rehersal- he refused to dance at all. Evidentally Nikolai was doing fine until little-blond-girl lost it back stage. Then he started going to pieces. His partner Madison, you can see, wanted to dance and wanted her parnter to dance. She was pulling him through the steps, and he almost started dancing. Madison’s efforts drew applause partway through the number and they all got confused and ran offstage. I think they got the most applause. Because dammit, getting onstage is hard. And dammit, they tried. And my Nikolai? well he got my hopes a little high during the dress rehersal… for awhile I was privately upset with him. Really though, a lot was asked of him and he did more than I ever expected. Kid, you done me proud. I didn’t finished because we had to leave for a ballet rehersal. The kids weren’t too interested in helping today. Usually they love to help me rip. They like to hold the knitted piece and run away from me, then I wind like crazy as they walk back. Changing the subject. There were 2 other knitters at the ballet studio today, waiting during the kids’ rehersal. None of us were near each other or talking of knitting at all. What’s wrong with this??? One lady was knitting in the round what looked like it would be a felted bag. The other was knitting something striped and cotton on straights. Whoever you are, knit on! And if you are just as shy as I am, sorry if I’m embarrasing you. Only about 7 inches long from nose to rump. Deceptively cute. Hopefully the cats won’t cross paths with it. PeeYew! This is for Whaledancer from over at Zimmermania who requested a more detailed recipe for the shorties. These can be knit in any size, at any gauge. So pick your yarn and needles and make yourself a nice big swatch. These are made entirely in the round, so make your swatch in the round too. Then measure (honestly) your thighs, hips, and waist. Take measurements on both thighs and average, just in case. Using your gauge and measurements you’ll calculate the stitch count for each section, then subtract some for negative ease. In case you’ve never made a garment this way I’ll show you my calculations here: My gauge throughout was 5 sts per inch. If you end up with odd numbers or fractions just round up a bit. Pick your favorite stretchy cast on and start knitting your legs on a 16in needle. Work in K2P2 ribbing for a couple inches before switching to stockinette and knitting to the desired length. My legs were 4.5 inches long, and they are very short, you may well want a longer leg. When your first leg is done you can store it on your 24in needle while you make the second. When both legs are done you’ll need to calculate your crotch stitches. Like so: [my numbers are in parentheses] Thigh stitches (88) minus half-hip (156 /2 = 78) stitches = crotch (10) stitches each leg. Put the crotch stitches for each leg on waste wool and assemble both legs on the 24in. needle. During assembly, place markers at center front and back, and at each side ‘seam’ Knit 2 rnds plain. Now we will start the short-row bum shaping. Knit across the bum to your left side seam- slip marker, wrap, turn. Purl back to the right side seam- slip marker, wrap, turn. Knit all the way around (one and a half rounds), and back to the left side seam – slip marker, K2, wrap, turn. Purl to right seam- slip marker, P2, wrap, turn. Knit all the way around again. Do you see the pattern? The next short row will be 4 stitches beyond the marker, then 6, 8, and 10. Knit one full round between each set of short-rows. These 6 short rows were all the shaping I needed. Other people may need more or less. Knit around until there are about 12 rnds at your center front marker. Then we’ll start the waist decreasing. This will decrease at the rate of 4 sts (2 pairs) every 3rd round. We’re going to start our decreases at center front and back and move outward one stitch every decrease pair. Like so: Knit to within 3 of front marker, SSK, K2, K2tog, knit to within 3 of back marker, SSK, K2, K2tog, knit 2 rnds plain. Next set of decreases: knit to within 4 of front marker, SSK, K4, K2tog, knit to within 4 of back marker, SSK, K4, K2 tog, knit 2 rnds plain. And so on through as many decreases as you need to reach your waist number. If you need to decrease a number of stitches that doesn’t divide evenly by 4, put the extra set of decreases at the back. Do they look like shorts yet? I would recommend that you put everything on waste wool and try them on now to see how they feel. Do you like the height of the waist? Do you need more/less bum shaping? I liked the bum, but wanted the waist higher (and to finish the ball) so I knit around another 10 rnds plain before switching to ribbing. When you are satisfied, start working K2P2 ribbing. You can add eyelets for a drawstring if you like. K2 YO P2tog around to make eyelets. Then keep on ribbing until you are sick of it or run out of yarn. Bind off loosely. Last bit of finishing is the gusset. If these are for everyday wear you probably don’t need one- just graft/weave the crotch sts together. If, however these are for a dancer or another high-kicker, the gusset is a good idea. This took me several tries and I’m not sure it’s perfect; but it’s functional and that’s just fine. So put both legs’ gusset stitches onto 4 dpns, join yarn and knit 2 rnds. Then on just one leg’s sts we’re going to do more short rows. I had 10 sts so that’s how I’ll explain it. K8, wrap, turn. P6, wrap, turn. K4, wrap, turn. P4, wrap, turn. K6, wrap, turn. P8, wrap, turn. K10, graft gusset and leg sts together. Make sense? You can extrapolate that out for however many crotch stitches you end up with. And that, my friends, is how we do that. If you have any questions or confusions please let me know and I’ll try to help!